Use this section to find out (quite a bit) about the BSA Program, and the degree to which Troop 77 embraces the way it "aught to be". All are welcome to contribute as much as they would like as a uniformed leader, Committee Member, or a Merit Badge Councilor (MBC). As a Committee Member, you should be willing to attend the monthly Committee Meeting (1st Tuesday of each month, 7:30PM) and get involved in as much/little upcoming activities as you wish. As a Merit Badge Councilor, you choose to provide counseling from 1 to many of the available 121 Merit Badges. YOU DO NOT need to be an "expert" to be a councilor, as the handbooks will cover ALL that you need to know to learn/teach each particular badge. As a Merit Badge Councilor, your time is ONLY used "upon request" when a Scout decides he would like to work on a particular badge for which you've agreed to be a councilor. Merit Badges are earned OUTSIDE of the weekly meeting, so Scouts meet with you ON YOUR SCHEDULE of availability. How much does Scouting cost? The Troop charges an annual fee of 150.00 CHF. There is a modest "food fee" for each monthly camping trip, and a 1x per year fee if your son attends week-long Summer Camp (highly encouraged!). The Activity Fee - helps to pay for annual registration, numerous awards, badges, pins, camp ground fees, and more. It usually is NOT enough for all expenses. Monthly "camp fee" (food fee) - . Each patrol creates their own menu for the monthly camping trip and can decide to raise or lower this fee to be aligned with their menu choices. TYPICALLY, this is $15-$20 each month. Summer Camp Fee - Week-long Summer Camp is a great experience, and we encourage Scouts to attend every year. Please start saving for this NOW so that Camp is not a "financial burden" when payment is due (usually May of each year). The annual fee also helps cover the cost of running the Troop. Covers new/replacement equipment (tents, stoves, cook gear, propane tanks, etc). Per the 12th point of the Scout Law, "a Scout is Reverent". Scouting's founder, Lord Baden Powell, believed that it was crucial to the development of the "whole person" that we have a belief in, and love for God, and that we should live by and embody His laws and teachings. Scouting does NOT promote any 1 denomination above another and works with organized religions to offer awards (officially known as the Religious Emblem Program) to any boys choosing to farther explore their religious faith, from Catholic, to Muslim, to Judaism, to Buddhist. Again, Scouting proves itself to be SUPPORTIVE of diversity and religious differences. However, as a Private organization, it is the right of the BSA to set a code or ethics and morals for its members to follow. As we believe "being reverent" is such a critical part of Scouting, we openly pray during meals, at meetings, and during non-denominational "Scouts' Own" services while we are away at camp. Will my son be intimidated by the older boys? We follow a ZERO TOLORANCE policy for bullying or unruly behaviour. By any and all measure, Scouting is (and should be) considered a "safe zone" where boys can come and GROW in a positive and supportive environment. Upon joining Scouts, boys are placed into a smaller unit called a Patrol - we currently have 3 patrols in our Troop. Per BSA guidelines, a patrol is "a group of boys (no more than 10) of similar age, interests, and abilities." BY DESIGN, your son will be among boys "like him" for most of his Scouting events. However, he will BENEFIT from the guidance and leadership examples of the older/larger boys who serve as Senior Leaders and skilled instructors. Even in mixed-patrol competitions, we have only observed caring and supportive interactions... and we DO watch (just in case). Scouting is a PRIVATE organization. Should any boy's behaviour become intolerable, it is well within our right to "un-invite" him from being a Scout in this Troop. What do boys do as "Boy Scouts"? The Boy Scout Of America Program is a 100 year old, professionally crafted, program of education and character development. By using the "Outdoor Method" (camping, fishing, rock climbing, etc) boys work together to do "the things boys like to do". In the process, they learn the value of teamwork, honesty, communication, mutual respect, and more as they work towards their goal and overcome any obstacles they encounter. By employing the Methods of Scouting, we reinforce the AIMS of Scouting, which are reflected in our Oath and Law. The goal is to see that they become permanent fixtures in the character of each Boy Scout as we teach them to be Trustworthy, Loyal, Helpful, Courteous, Kind, Obedient, Cheerful, Thrift, Brave, Clean, and Reverent. We meet on Tuesday evenings from 7:30 PM either CDL or LGB, alternating every month. Uniforms - Class A with neckerchief. When we Travel to a Camp, we wear Class A (with neckerchief) both to and from the destination. The difference between Rank & Merit Badges? Rank is an interesting word choice, clearly derived from Scouting's origin as a program modeled after a military structure. Those holding a "higher rank" do not order around those of "lower rank". In Scouting, the term "rank" is a PERSONAL measure of his progress along the "Trail to Eagle"... or more appropriately thought of as his "trail to manhood". When a boy joins Scouting, his first POSITION is one of "Scout". Now a demonstrated "safe" Scout... he is ready for his next period of personal development, which is LEADERSHIP. In the pursuit of Star, Life, and Eagle, a youth is learning (and then mastering) the skills of leadership. By holding leadership positions within the troop, he learns to lead, instruct, and inspire others. He learns to "give back" to others, and also learns his emerging place in Society as a citizen. There are 121 various Merit Badges available (only 21 needed for Eagle). To ensure that the Scouts are getting a taste of the opportunities available, the higher badges of rank require a set number of merit badges be completed (including some designated as "Eagle required"). Merit Badges offer exposure to a diverse background of interests, adventures, and opportunities that Scouts may never experience IF NOT for the Scouting program (Aviation, Scuba, Reptile study, shooting sports, etc). It is not uncommon that exposure to a topic via the Merit Badge Program leads to life-long hobbies and career choices, as well as "needed skills" like Home Repair, Auto Mechanics, and Public Speaking. There is no limit on the number of Merit Badges a youth may earn. Officially, the BSA has ONE uniform, and any historical version of it is acceptable (once official, always official). It is found in the front pages of every Scout Handbook. 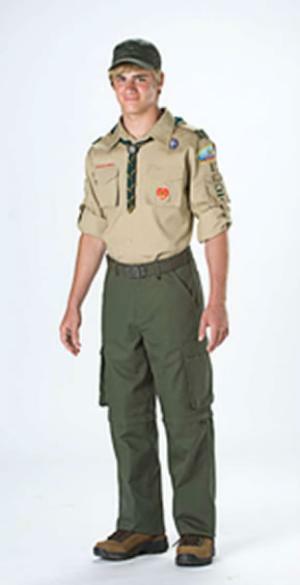 This is THE official uniform, but in many pieces of BSA literature it may be referred to as the FIELD uniform, or commonly, the "Class A". * We wear BSA tan shirt and the neckerchief bearing our logo is to be worn UNDER the collar with the top button of the shirt unbuttoned. ** The Merit Badge Sash, worn over the right shoulder, is impractical for most Scouting-related activities. It is therefore only worn at ceremonial events or select meetings such as a Court of Honor. It is not always practical to wear the Field Uniform shirt every minute a Scout is involved in a scouting-related activity. It is customary practice that when a troop (as a whole) agrees on a standard shirt, they will opt to wear it INSTEAD of the BSA olive shirt, and in many items of BSA literature, this will be referred to as an ACTIVITY uniform, or sticking with military nomenclature, "Class B". Historically, the BSA offers major redesigns to the uniform about every 20 years. This past year, the BSA announced the "Centennial Uniform" with "switchback" pants and some color changes to troop number decals and shoulder loops. This is the 5th major redesign in the BSA's 100 year history. Does my son have to come every week? We certainly won't send the "Scout Police" out to find you if you don't show up, but you miss out on a big part of the BSA Program if you don't attend regularly. Scouting is NOT just playtime, or "Billy's weekend fun" away from his kid sister. Scouting is a carefully crafted character-development program. Each boy is a member of a PATROL, and as such, is part of a smaller group (as compared to the whole Troop of boys) where he is given AMPLE opportunity to play an active and valuable "hands on" role in the patrol's success. A boy who shows up sporadically DEPRIVES himself of the chance to make key decisions within his patrol; choose trip ideas and destinations, make menu selections, divy out workload, and build close friendships. Every meeting includes a period of valuable skill instruction and fun interpatrol competitions that relate to the upcoming camping trip. If a boys misses a meeting, he will find himself less prepared for the upcoming weekend in the outdoors. The troop meetings are where we "learn", but the camping trip is where we reinforce the skills by putting them into practical use. Scouts should make every effort to attend meetings on a regular basis. Those who don't are missing out on the full experience of their limited Scouting years, and are causing their patrol members to do the same. Which political party does the BSA endorse? By National policy, the BSA is APOLITICAL. We have no affiliation with any one political party, nor are Scouts (in uniform) permitted to act in ANY WAY that would be interpreted as giving support to any 1 political party or political issue. Uniformed Boy Scouts may serve as the Color Guard at political events, but must exit the stage before any political speeches or grand-standing take place. By Constitutional Charter, the President of the United States is the Honorary President of the BSA. Does the Troop have some "Bylaws" that I can read? Bylaws are not necessary in Scouting units. Every aspect of how the Program should function is already laid out in clear detail in the Scoutmaster's Handbook, the boy's Scouting Handbook, Guide to Safe Scouting, and the National Council's training documentation for the Troop Committee and the various Committee positions. What if my son is not advancing? Advancement in Scouting is STRICTLY the responsibility of each individual Scout. Through his Patrol Leader, he should voice his desire for trip destinations, activities, and opportunities to complete the various rank requirements and attend trips that HE finds exciting and thrilling. HE is responsible for informing the Scoutmaster (in advance) of his choice to begin working on a Merit Badge; the completion of which is up to HIM and his Merit Badge Councilor. Through INDEPENDENT work (with a friend or family member - to comply with Youth Protection) he will work with his MBC to complete Merit Badge requirements at his own pace. At meetings and on camping trips, AMPLE opportunity is made to complete work and FREQUENT reminders are made to encourage boys to "step up" to make the most of their opportunities. Periodically, all boys will attend a Board of Review (BOR). Boys advancing to their next rank MUST attend the BOR as a requirement, but the Advancement Chair is also responsible for scheduling periodic BORs for boys who are NOT advancing to inquire as to the reason they are not progressing, or finding out what is "missing" in the Program. AT ANY TIME, Scouts (with/without their parents) are free to inquire about advancement to the Scoutmaster or his Assistant Scoutmasters. The SCOUT is ultimately responsible..... that's what makes the "Eagle" rank so significant and valuable. Attaining "Eagle" tells the world, that this is a young man who is responsible and a leader. Can a boy be "demoted" or have badges taken away? Firemen' Chit and Toten' Chip are safety badges and it is at the discretion of the Troop Leadership to revoke a Scouts PRIVILEGES for fire-starting or knife/axe use. Should this ever happen, the corrective process is usually retaking the instructional course. Until that happens, a Scout is not permitted to carry/use a knife, nor may he start or tend a fire. What is a Court of Honor? A Court of Honor is a Boy Scouting awards ceremony, commonly held quarterly throughout the year. At the Court of Honor, Scouts and their families gather for a formal recognition of advancement(s) and accomplishments that have been earned since the last Court of Honor. There are also periods for the Troop's Committee Chairperson to speak to the state of the Troop, or for some other event such as Scouting's annual Friends of Scouting campaign. By ceremoniously recognizing the value of advancement and hard work, we hope to strengthen a boy's motivation to continue being active within the Troop. The Court of Honor also gives parents/guardians valuable insight to accomplishments or Program happenings they may not see due to their lack of presence at the weekly meetings. As always, the goal is to ENCOURAGE, through positive reinforcement and praise. How many merit badges can I work on? There is no limit to the number of merit badges a Scout can have "open" at one time. He may start working on Merit Badges the day he signs his registration form and has until his 18th birthday to complete the work. Some units impose their own limits, but that is NOT BSA policy, and therefore, we do not endorse such restrictions. That being said, the idea is to LEARN about a particular topic through the Merit Badge Program. A boy will be best-served if he strives to complete the work for a badge in a short enough time frame that ALL the information/lessons remain relevant. Again, this is at the Scout's discretion. Can I keep working closely with my son? If you mean "work with your son" like you did in Cub Scouts, the answer is NO. There is little 1-on-1 work as a Boy Scout. Make no mistake... You are welcome, but Boy Scouting is a new phase of his personal development. "Dads & Lads" was the Cub Scout model. Your presence helped to guide him, keep him under control, and reinforce the importance of "family", but as a Boy Scout, he needs to focus more on himself, and on working with peers. He's becoming a young man and needs to start interacting with other adults like the Scout Master, Assistant Scout Masters, and various Merit Badge Councilors. He also needs to become comfortable with working without adults hovering over him as he works with his patrol. What is the minimum age to become an Eagle Scout? 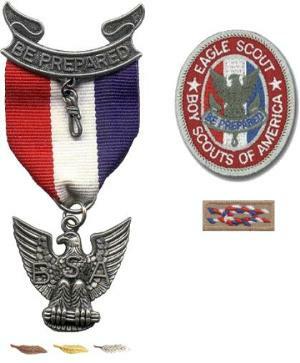 The BSA does not list a minimum age before a Scout can earn his Eagle rank. However, a boy must be at least 10 years old to join a Boy Scout troop, then there is a 30 day requirement in Tenderfoot requirement 10b, at least 4 months between First Class and Star, 6 months between Star and Life, and then 6 more months between Life and Eagle. So the minimum possible age, while NOT listed as a "REQUIREMENT", would be 11 years and 5 months. The national average for those earning Eagle Scout: 14 years of age. We're looking at troops. What should we look for? WHAT should you look for when you visit a troop? WHAT are some signs of a "good" unit? Were the boys AND leaders in the proper uniform? Were YOU welcomed? Did they make you feel genuinely welcomed and wanted? Are they having FUN? Do boys look interested, or bored? Is there room for you as a leader or on the Troop Committee? If you're told, "we're all full", that is NOT a good sign! Are the boys well behaved? Do they respond to the "Scout Sign" or was someone screaming "SIGNS UP!!!"? Any screaming is a warning sign. Ask what trips they've had, and what they have planned. Do they do the same thing every year, or are they always trying something new and exciting? WATCH YOUR SON! Did he blend in? Did the boys make efforts to include him? Watch for different "stages" of the Troop meeting. There should be distinct periods of Skill Instruction, Patrol time, Inter-patrol Activity, and some formal opening and closing ceremonies. What is the ONE bit of advice for a Scout? The Boy Scout Handbook does an EXCELLENT job explaining the BSA Program. It also provides valuable skill instruction and has the potential to IGNITE dreams of adventure, exploration, and fun for boys of all backgrounds and abilities.... all of which are POSSIBLE in this troop! "I'm bored" are the 2 words NO Scout has a right to say, as we are determined to help bring all their ideas into reality. Spend time with your son each night (especially if he is new to Scouting). Read the book with him. Quiz him on a skill, or "challenge" him to a knot tying contest. Ask him how he sees himself living up to the Scout Law. Don't let Scouting be "1 hour a week" each Tuesday night, but a regular and routine part of every day. How do Scouts earn Merit Badges? The day a boy signs his BSA application, he is eligible to start working on Merit Badges. Completing a Merit Badge involves 4 people... The Scout, the Scoutmaster, the Merit Badge Councilor (MBC), and the troop's Advancement Chair. 1. Scout chooses a badge (or badges) that he'd like to work on (alone or with another Scout). 2 He informs the Scoutmaster of his intention to work on a badge, and is issued a "blue card" and given the contact information for a registered Merit Badge Councilor (MBC). A MBC can be ANY registered MBC in any Council. He is not obligated to work with councilors in his home unit or Council. CONTRARY TO URBAN MYTH, the Scoutmaster can NOT deny any Scout the opportunity to work on any badge, nor can he delay the badge being awarded once the MBC signs the "blue card" showing that it is complete. Judgment as to whether a Scout successfully completed the badge requirements rests solely with the MBC. 3. The Scout(s) contacts the MBC and make arrangements to meet as often as necessary to complete the badge requirements (following Youth Protection guidelines at all times). Upon the first meeting, the Scout presents the MBC with the blue card, which the councilor keeps so that he can update completion dates and keep track of the Scout's progress. 4. Upon completion, the MBC will sign all 3 segments of the blue card, and return it back to the Scout who in turn, presents it to the Scoutmaster for final signature indicating final recognition that all work is complete. Again, the Scoutmaster does NOT have the authority to deny, "retest", or delay the formal completion of any MB work. * While NOT mandatory that a badge be presented right away, the BSA strongly encourages "instant recognition" for effort. The typical model is to present the badge by the next meeting, and present the "pocket card" during a formal presentation at the next Court of Honor. 6. The Scout will be given 1 segment of his blue card which he must keep so that it can be produced when applying for his Eagle Rank. The Troop should also retain a segment for their records. What badges are "Eagle Required" ? There are a total of 21 Merit Badges required for the rank of Eagle. 12 of these badges are Eagle Required "White Bands" (merit badges with white/silver border stitching around the edges). The remaining 9 (or more if you choose) may be any badges from among the remaining 109 non-Eagle required "Green Band" merit badges (badges with green stitching around the border). While there are 15 possible Eagle Merit Badges, there are some that are "optional". Refer to the picture to clearly understand which badges qualify for Eagle, and which ones do not. Earning MORE THAN ONE of the optional badges will NOT afford you the choice to NOT earn other required badges, but "extra" Eagle badges can be counted towards the mandatory total of 21. What kind of knives can Scouts carry? Contrary to urban myth, the only regulation on this (other than earning the Toten Chip award) is the restriction that may exist at part of State/Local law. National BSA DOES allow Councils and Districts to set their own rules, so long as the rules result in a SAFER result. While the BSA strongly encourages folding (preferably locking) pocket knives, fixed-blade, or sheath knives are allowed. In fact, the Guide to Safe Scouting specifically lists "fillet" knives as a prime example of a sheath knife that is appropriate for Scouting purposes (Fishing MB requirements). Fixed blade knives are big, bulky, heavy, and generally far more "knife" than a Scout needs. Some BSA camps impose their own limitations, which visiting Scouts are obligated to respect, regardless of Troop or BSA/TAC policy. Troop 77 respectfully asks that adults encourage their sons to carry the appropriate knives (small, folding pocket knife), as these are more than adequate for 99% of all scouting activities. Do all boys carry knives? A knife of some type (typically folding pocket knife) is an integral part of the Scouting Program. HOWEVER, all Scouts must pass instructional safety training to understand the STRICT provisions for using a knife safely, and at appropriate times, before he is allowed to possess or use a knife. The training covers the use of saws, hand axe, long axe, as well as knives. This training is known as the Toten Chip and has a corresponding award of the same name. The award may be the pocket card (size of a business card) or if sold in the Council's Scout Store, a Toten Chip patch. The patch is "official" in the TAC/Horizon district. The card is now considered a part of the official uniform. A scout is expected to have his "Toten Chip" with him if he is carrying his knife. If a Scout falls short in his responsibility of safe knife handling, he may lose his Toten Chip privileges and it is up to the Scoutmaster's discretion as to how the privilege can be re-earned. 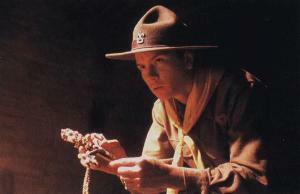 In Troop 77, it is typical that a Scout who loses the privledge must repeat training, AND then TEACH the Toten Chip session to another scout. Do you sleep in tents, cabins, open sky? In the months of January, February, and March we have traditionally done "cabin camping". However, if the Patrol Leaders' Council decided to do something different, we would certainly respect that decision. Cabins have double-decker bunk beds and wood burning stoves for heat. Most of the cabins also have some type of kitchen facility. The remainder of the year, we experience "tent camping". If boys so choose (hopefully as a patrol), they can sleep under the open sky (no tent) or for those feeling even more adventurous (or working on their Wilderness Survival merit badge) may choose to build their own structure and sleep in it overnight. What is the purpose of a "patrol"? A significant part of the Scouting experience is to get plenty of HANDS ON activity. From knot tying, to cooking on a fire and stove, to learning how to use a pocket knife or axe... Scouts "DO". In order to make sure everyone gets a chance to DO, boys are divided into smaller groups within the Troop so that everyone gets ample opportunity to participate. This is part of what the BSA calls, "The Patrol Method". Within a patrol-sized group, boys do not get "lost among the crowd" or feel as though their opinions (and votes) don't matter. Each plays a critical and important role in the Patrol's success. Patrols are the building blocks of a Boy Scout troop. A patrol is a small group of boys who are similar in age, development, and interests. Working together as a team, patrol members share the responsibility for the patrol's success. They gain confidence by serving in positions of patrol leadership. All patrol members enjoy the friendship, sense of belonging, and achievements of the patrol and of each of its members. What do you mean by "Boy Led"? A Boy Scout troop leads itself. Adults are present to guide and ensure safety & compliance exists, but it is the YOUTH who make key decisions. The Scouting program using The Patrol Method means the Troop members ELECT their own leaders; individual Patrol Leaders and a Senior Patrol Leader (SPL) who takes on "ownership" and hold the actual leadership position within the Troop. The SPL appoints an assistant scout (Assistant Senior Patrol Leader - ASPL) and various other leadership positions. While serving as Senior Leaders, the SPL and ASPL cease to be members of their respective patrols and function as peers with the adult leadership. The SPL and ASP execute Program decisions, lead the meetings, plan agendas, pick camping destinations, and LEAD BY EXAMPLE when executing the agenda that the boys themselves created and agreed to follow. Patrol Leaders are responsible for the well being and actions of their individual patrol and will REPRESENT their patrol in the Patrol Leaders Council (PLC). At the PLC meeting (chaired by the SPL and monitored by the Scoutmaster or Assistant Scoutmaster), Patrol Leaders plan future trips and troop meetings. Through a model of Representative Government, they CHOOSE the trips and activities THEY want to do, and appoint other scouts to serve as skill instructors, or lead games or other activities. Adult leadership keeps them on track with suggestions and advice, but the decisions are ultimately left to THE BOYS. Once the future meetings/camping trips are planned, the SPL and Scoutmaster present the PLC's plans to the Troop Committee for review. The agenda is checked for issues such as necessary fund raising, unique equipment/skills, camp ground reservations, and is given an over-all inspection to confirm that trips are aligned with the purpose of the Scouting Program. If the plans are approved, and the weekly meetings are lead by the boys (as designed) unless the skill instruction needed is currently beyond the skill set of the Scouts, or relates to merit badge requirements, then adults will render assistance. ADULTS are a RESOURCE for guidance and ensuring that things are done the "BSA way" for safety, youth development and general direction setting. "Boy Leadership" really means the Troop is doing the things the BOYS THEMSELVES want to do, and in doing so, will develop the leadership, communication, problem resolution, and organizational skills that underscore why Scouts excel in all other areas of their lives. What gear is required for camping? How big is the Troop? 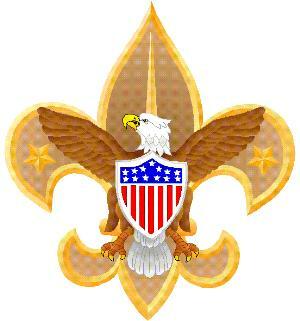 As of September, 2009, BSA Troop 77 has 20 Scouts ranging in age from 11 to 17. These Scouts have split themselves into 3 patrols; Llamas on Mars, Flaming Falcons, and The Trees. There are 3 uniformed leaders (2 of which are Eagle Scouts) who are regular attendees at the weekly troop meetings, and numerous other adults registered as committee members and/or merit badge councilors, each committed to the well-being and growth of the Scouts. Can I attend camp with my son? Other than high-adventure bases like Philmont or Sea Base, where adults are required to be BSA Registered Leaders, there is nothing in the BSA Program that prevents parents or legal guardians from attending camping trips with their sons. The Guide to Safe Scouting says, "There are NO 'secret societies' in Scouting. An adult may attend any scout function with their son". THAT BEING SAID... there are some guidelines visiting parents are expected to follow. 1. Scouting's "Youth Protection" guidelines MUST be followed. Registered leaders can explain these to you if you are not already familiar with them. 2. Part of what you son is supposed to be experiencing at camp is becoming a functioning member of his patrol. Therefore, he WILL sleep with his patrol, eat with his patrol, do KP (Kitchen Patrol) duties with his patrol, and perform campfire skits with his patrol. You may watch and advise... but LET HIM "do". 3. Attending parents will eat, tent, and in all other ways, "function" among the attending adults. Expect to be "put to work" over the weekend. 4. Smoking, chewing tobacco, alcohol, profanity and the like are NOT welcome in Scouting. We expect (and at BSA camp grounds it is required) that you do not smoke at Scouting events. If you feel that you "must" smoke, you are expected to not be in view of any Scouts (our troop or other). 5. Do not expect your son to sleep in your tent. While it is "technically" allowed under BSA Youth Protection, it impedes his development as a self-reliant Scout and the cohesion of his Patrol. We STRONGLY discourage any attempts to bunk with your son. 6. Siblings are not welcome to remain at over night excursions, the only exception being 2nd Year WEBELOS scouts, who are actually encouraged to begin interacting with a Boy Scout troops (if our camping agenda is appropriate for WEBELOS-aged boys.). 7. Non-legal guardians (boy/girl friends of single parents) are not to remain over-night at camping excursions. 8. Adults who plan to attend camp MUST inform the Scout Master 1 week ahead of time (indicate attendance on the Permission Slip). Despite its 100 year old heritage, Scouting is a "constantly evolving" program. One of the things National BSA realized over the last few years is the need to offer "High Adventure" activities to retain older boys who find high school, jobs, girls, sports, etc. competing for their time. High Adventure groups can be "Venturing Patrols" (a patrol within a troop), or a separately chartered unit known as a "Venturing Crew". Venture Crews (age 14 to 20) can be co-ed, providing both male and female leaders are registered and present. What is a Scoutmaster Conference? After a Scout completes all the required tasks towards his next badge of rank, the next step is for the Scout to meet with the Scoutmaster for a "Scoutmaster's Conference". The Scoutmaster wants to hear from the Scout exactly what he likes, doesn't like, might want to do different, etc. He wants to know what his ambitions are in Scouting and "life". The ultimate goal is to make sure the Scouting experience is of real benefit to the Scout's development. Once the Scoutmaster is convinced the Scout is ready to move forward towards the next rank, the Scoutmaster will direct the Scout to meet with members of the Committee, where a similar meeting will take place. This is known as a Board of Review. What's so special about "Eagle Scout"? Becoming an Eagle Scout is no small achievement. In fact, among adults who have gone on to become astronauts, doctors, politicians, or business leaders, most of them will say that earning their Eagle is clearly among the most important achievements in their lives. Back to the question... WHY? Look at it from this angle.... ADVANCEMENT is completely up to the individual Scout. If he has no desire or sense of commitment to advance in rank, that is his choice. IT IS POSSIBLE for a boy to attend EVERY meeting and EVERY camping trip, and never make it through 1/2 of the available ranks if he isn't motivated enough to take the extra step of demonstrating skills or earning merit badges. Statistically speaking, only 2 out of 100 boys in Scouting will push themselves to become Eagle Scouts. The "Trail to Eagle" is one of persistence, dedication, well-rounded learning experiences by earning 21+ merit badges, strong attendance at meetings and camping trips, and hundreds of hours of community service.... all culminating with the planning and complete execution of his "Eagle Project" before his 18th birthday. The "Eagle Project" is SO MUCH MORE than "giving something back to the community" (which it is, and let's not minimize the importance of community and charity). It is actually his "final exam" in Scouting. HE manages his Eagle Project. He will put to use all of the lessons he learned as a Boy Scout; communicating, organizing, recruiting, conceiving an idea, selling the idea, planning the work, assigning work details to those helping him, being the "accountant" that tracks the hours worked and the money spent, etc. In every conceivable way, HE is the "project leader". THESE are the highly desirable skills and traits that makes "Eagle Scout" stand out on a job resume or college application, and the fact that such skills and moral foundations are learned/mastered before "society" recognizes him as an "adult"... simply amazing! What is a Board of Review? After a Scout completes his Scoutmaster Conference, he is to appear for a Board of Review. How is the Program (including adult leaders) running, and is there anything the Committee should/need to do to make the Program better? Why does the Scout feel as though he has earned his rank and is ready to move forward to the next rank? There will be several questions put to the Scout by 3 to 5 Committee members comprising the Board, but ultimately, the 2 questions above are what is being addressed. For example, a Scout will not be asked to tie a square knot, but may be asked "which knot was the hardest, and how did you get yourself to finally learn it?" Like a job interview, the Scout MUST come properly dressed; wearing the full (clean and presentable) BSA Field Uniform. After meeting with the Scout, the Board will debate, and if they are in unanimous agreement, will allow the rank advancement to be recognized. How fast can my son advance? Advancement in Scouting is COMPLETELY under the control of the Scout himself. As fast as he can learn the skills, he can get credit for them towards rank advancement. TYPICALLY, it will take more than 1 year for him to make it from Scout, to Tenderfoot, to 2nd Class, and then to 1st Class. We do use a "1st Class in the 1st Year" agenda to keep newer boys focussed (and soften the "culture shock" from coming from a Cub Pack to a Troop). A Scout can work on the requirements for rank IN ANY ORDER, but his actual progression through the ranks must be sequential. Some of the rank requirements have SET TIMES that must be met before he can get credit for them and advance. These are clearly outlined in the back pages of his Scout Handbook. A boy has until his 18th birthday to reach Eagle and/or be a Boy Scout, but the typical age of an Eagle in the BSA is a surprisingly young 14 years of age. Reaching Eagle is NOT an easy task and requires an abundance of effort and self-motivation. Encouragement at home is CRUCIAL to a boy's success towards his Eagle Rank. Is there any hazing in Scouting? Absolutely not. "Hazing" or similar types of practical jokes are simply not tolerated. Our church has a pack and a troop already. Do you need to bridge into the Troop where you are currently a Cub Scout? Absolutely not! Just because a charter organization has "their own" Cub Scout pack and a Boy Scout troop, a boy is NOT obligated at all to bridge into that Troop. If you are given any pressure to do so.... that's probably a sign for you to run in the other direction! While all Troops (should) follow the same BSA Program designed by the National Council of the BSA, you will find every troop has a program MUCH different than any other. Some predominantly like to HIKE, others BIKE, some CAMP while others CANOE. Some are "year round" (we are), and others take a summer break. It's in your son's best interests to shop around and make sure the place he is likely to spend the next 7 years of his Scouting career is going to be the best fit for him. A boy should have NO pressure placed on him as to which troop to join. We draw boys from all over the area. Our Program is strong, our facilities are BETTER than most scout camps, and (sadly) you will find our dedication to doing things "by the book" is more rare than it should be. Please shop around.... we'd love for you to be our guests one night. Why do Scouts wear a Uniform? Scouting's founder, Lord Baden Powell realized long ago, that when people look the same (uniform), they not only show they are members of an organization, but being dressed the same ERASES all trace of "class" or "wealth" or "social status". In Scouting, all are equal and treat each other with respect. In doing so, we learn to look past class, income, race, religion, nationality, and social status. Despite the attacks from some of Scouting's detractors, there has never been a program so OPEN and SUPPORTIVE of diversity as Scouting. Considering this was taken into account in 1907, Lord Baden Powell was clearly a man ahead of his time. Wouldn't it "run smoother" with adults in charge? Yup... it probably would. But why would we want that? This is BOY SCOUTS... not "fathers getting away for the weekend" Scouts... nor is it "WEBELOS 3" where adults are in the leadership role as in the Cub Scout program. This is where boys LEARN and DEVELOP their leadership skills so they can become capable young men. We DON'T EXPECT them to be the most efficient and organized leaders (and neither should you). This is their learning ground. Here is where we want the "mistakes" to happen, so they can learn from them. This is how we TEACH leadership skills instead of getting adults to "step in" because we could be "more efficient". Remember... the program is NOT DESIGNED to run perfectly. They may elect their "best friend" instead of the "most qualified"... and they will experience the consequences of casting a "careless vote". They may elect the Class Clown instead of the Class President... and NEED to "suffer" through a few months of a weaker or chaotic Program. Remember, NOTHING happens here by accident. Trust us. Trust the 100 year old program. Have faith. Keep your boy coming ESPECIALLY if he comes home with a few "complaints" on how things are being done. Ask him what he would do differently or what he did to try to correct what appears to be a "screwed up" situation. HERE is where the Program really shows its value.